The Natural Sleep Store is excited to feature one of our newest products for the November giveaway! Now through November 30th, enter to win a Standard size Alpaca Pillow by Crescent Moon (you choose the loft)! Giveaway valued at $159.00. No purchase necessary to win. The Alpaca wool pillow is so unique— it’s fluffy and soft, similar to a down-filled pillow, but has firmness and a supportive feel to it too. It’s the best of both worlds. We love that the alpaca wool is 100% natural and organically grown, as the alpaca are raised with cruelty free methods in a pesticide-free environment, and the wool is processed without the use of bleaches, dyes or chemicals. They are treated like pampered pets! Alpaca fiber is soft and light so it’s combined with a little bit of sheeps wool to hold the fibers apart and create loft. 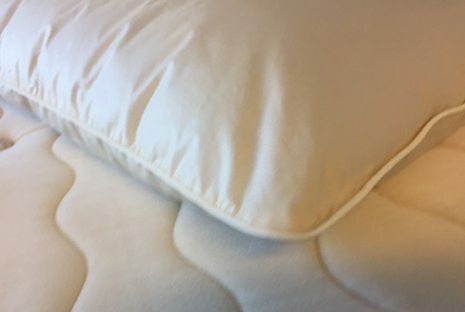 Crescent Moon uses 100% organic cotton fiber to make the pillow encasement, which is a smooth, 260 thread count sateen in an un-dyed natural color. Piping around the edge of the pillow gives a clean, polished look. Alpaca fiber is a renewable resource, and at the end of the products long life, it is 100% biodegradable…added benefits to this already amazing product. We are so happy to have another new and different pillow to add to the options offered by The Natural Sleep Store. We know that pillow preference is a very personal thing and with it’s soft, supportive feel, the Alpaca Pillow is sure to be the perfect choice for many! Enter now to win the Alpaca Pillow by Crescent Moon. Giveaway valued at $159, no purchase necessary to win. Congrats to Janice P, from Hopkinton, IA, you won our November giveaway!